Express Glass, Miami Florida's top glass repair company, has announced extended 24 hour glass repair service. Emergency glass repair available for St. Patrick’s Day, March 17, 2016. We want to remind bar owners that during St. Patrick’s Day, if the party gets too rowdy and window or door glass breaks, we are ready to fix the problem 24 hours: before, during, or immediately after the festivities. Miami’s top rated glass replacement service, Express Glass has announced extended service for St. Patrick’s Day, March 17, 2016. 24 hour glass repair will be available to restaurants, pubs and bars open late during the busy St. Patrick’s holiday. Busy business owners are encouraged to reach out to Express Glass & Board Up prior to the holiday, so that they can have top priority. To do so, they are advised to either call the company or visit the updated page for 24 hour glass repair service in Miami and other Florida cities at http://www.expressglassfl.com/commercial-glass-repair/emergency-glass-repair-services/. Details about 24 hour emergency glass repair and replacement are available. Miami restaurants may be famous for Latin celebrations, but around St. Patrick’s Day businesses go Irish. Due to the historical tradition of lifting Lenten restrictions for a day, rowdy parties can be expected as customers indulge on St. Patrick’s Day. Bars may stay open later while patrons enjoy several pints of Guinness or Irish whiskey to celebrate. It is also a time when the need for 24 hour glass repair occurs, due to unfortunate issues often connected to excessive revelry. 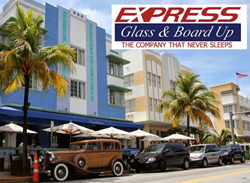 Express Glass has announced extended service to all Miami bars and restaurants for 24 hour glass repair emergencies. Broken window glass by overly-jubilant customers requires quick and professional glass repair. Emergency glass repair is available 24 hours to restaurants and pubs during the St. Patrick’s holiday. Miami bar managers can celebrate the luck of the Irish with 24 hour glass repair available, just in case things get out of hand. Express Glass and Board Up Service Inc. is a family owned and operated 24 hour glass repair business with more than 20 years of experience. Professional technicians and the large variety of inventory make Express Glass the top glass repair service. Customers looking for Miami 24 hour glass repair or Ft. Lauderdale glass repair as well as emergency 24 hour glass repair in Delray Beach or West Palm Beach please reach out to the company for a free estimate. If customers need a 24/7 Sliding Glass Door repair service in Miami, Ft. Lauderdale or Boca Raton, technicians are standing by. The company specializes in 24 hour glass repair, sliding glass door repair and window glass repair. Technicians will handle any emergency glass repair and replacement situation. Home or business glass repair is the company's main priority.